Clean processing The knife parts are assembled without grooves. This is especially important for hygiene. There are no irregularities or burrs on the blade or the handle, which prevents proliferation of bacteria. Safety The handle and bolster are shaped for gripping the knife firmly so it will not slip. An ergonomic handle and just the right weight ensure working comfortably and safely. Cutting consistency With proper care, a good knife will stay sharp for a long time. Corrosion resistance The more finely polished the blade, the more resistant it will be to corrosion. Knives and the dishwasher Quality knives with plastic or fine steel handles are dishwasher safe (preferably with an economy programme and maximum temperature of 55º C). However, we recommend washing by hand because it is gentler. Knives with wooden handles can be washed only under running water. The knife comes in a plastic-covered cardboard box (see photo). Standard Shipping £11.21 To be delivered between on Monday, April 29 and on Tuesday, April 30. Super Express shipping £50.38 To be delivered between on Thursday, April 25 and on Friday, April 26. The history of Zwilling J.A. 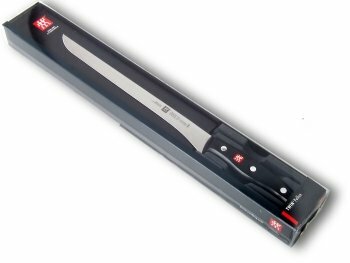 Henckels goes back to June 1731, when Peter Henckels registered the Zwilling brand (the word means "twin") with the knife-makers guild in Solingen, Germany. Today Zwilling is Germany's leading cutlery maker and sells its products in over 100 countries. Its knives are synonymous with top quality and functionality throughout the world. The stainless steel used for Zwilling knives combines high carbon content with chromium and other components that make it ideal for cutting tools.